# I have been thinking of late about roommates and conflicts. 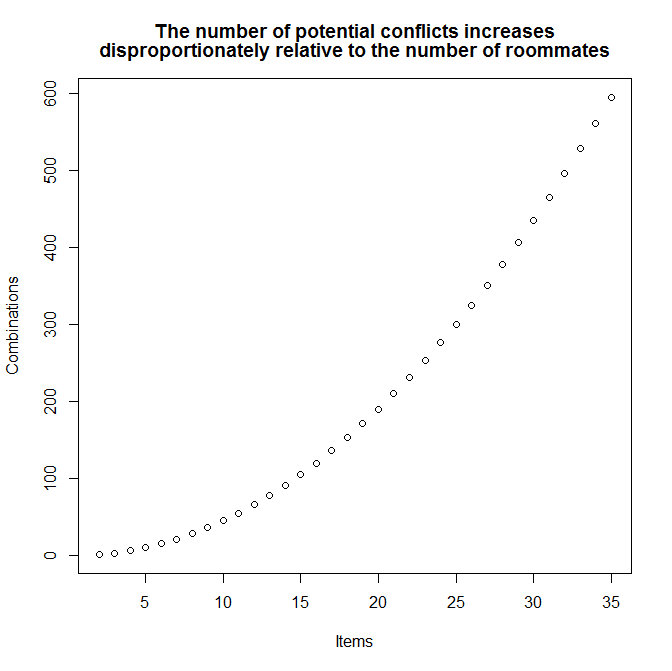 It seems to me that the more roommates you have, the more likely you are to have some kind of explosive conflict. There seems to be very discrete thresholds. # Which is 1 because there is only one combination possible from a pool of only towo. # If there is three people then the probability is combination choose 2 from 3. # If there is three people then the probability is combination choose 2 from 4. # There are 6 of these A&B B&C C&D A&C A&D B&D. # If you were to cram 5 roommates into one house then there could be 10 potential combinations. 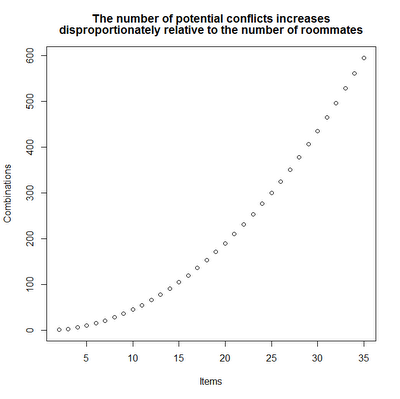 # IF there were six roommates then potential number of conflicts increases to 15. # Thus large families always seem to be fighting. Likewise it is hard to find examples of non-family members sharing a home with more than three or four roommates. # The overaching point is that though we are only increasing home occupancy by 1/2,1/3,1/4,or 1/6 the effects of adding one more person discontinuously increases the number of potential conflicts. # We need to loop through all of the a's for this operation because a is already a vector so 1:a will not work for us. # Thus if each person is likely to be in conflict with each other person at a probability of 10% per combination then likely number of conflicts per year with 20 people is 20 conflicts. Thus it is necessary for large organizations of people to establish rules by which conflicts are managed. You did as you promised! ;) I found the article interesting. I'm glad you're keeping up with your blog, -- amazing really.